House of Talons is the fifth Chapter Pack in the Wardens cycle for A Game of Thrones: The Card Game. Stand strong with Renly's Rainbow Guard, ride the sweeping plains of Essos with the Dothraki, or raid Westeros with the Clansmen of the Vale in this Chapter Pack. The major themes of the Wardens cycle continue in House of Talons, offering more support for trait-based decks, limited responses, and high-cost, iconic characters from A Song of Ice and Fire. 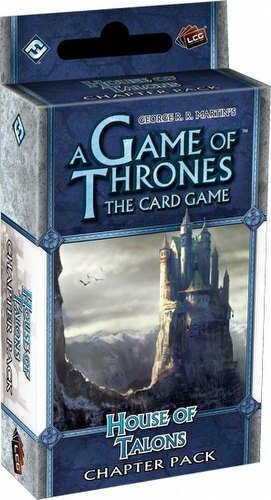 Aside from offering support to each of the six Great Houses in A Game of Thrones: The Card Game, House of Talons also includes new characters bearing the House Arryn trait, offering new ways to take advantage of Castle plots. Each pack includes 60 cards (3 each of 20 different cards).